In the Kalahari Desert of southern Africa sociable weaver nests are a prominent feature in the landscape. These large nests typically occupy camelthorn trees and provide a refuge to a range of organisms, including Kalahari tree skinks (Trachylepis spilogaster). They also provide refuge for a predator of the skink: the African pygmy falcon, which roosts and nests in these large colonies. In a recent study published in Austral Ecology, Tasmin Rymer, Robert Thompson and Martin Whiting show that skink abundance was positively correlated with weaver nests. Skinks also frequently perched on the nest and used it as a refuge from predators. Surprisingly, the presence of pygmy falcons did not affect skink abundance perhaps because of the abundance of refugia created by the nest’s presence. The authors suggest a number of potential benefits that the nests provide including greater prey availability, thermal refuges and lowered predation risk, all of which remain to be tested. 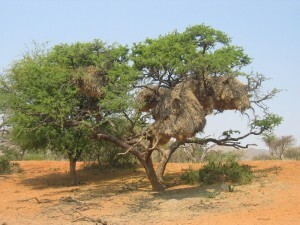 Camel thorn trees (Vachellia erioloba) containing sociable weaver nests in the Tswalu Reserve of the Kalahari Desert. Photograph by Robert Thompson. The way in which animals use habitat can affect their access to key resources or how they are buffered from environmental variables such as the extreme temperatures of deserts. One strategy of animals is to modify the environment or take advantage of structures constructed by other species. The sociable weaver bird (Philetairus socius) constructs enormous colonial nests in trees. These nests are frequented by Kalahari tree skinks (Trachylepis spilogaster) and the two species coexist over a large portion of the Kalahari Desert in South Africa.We tested whether skinks were more abundant in trees containing sociable weaver nests and asked whether the physical features of trees were important predictors of skink abundance. We then focused on potential costs of this association by examining the relationship between skink abundance and the presence of a potential predator, the pygmy falcon (Polihierax semitorquatus), which exclusively uses weaver nest colonies for roosting and nesting. Finally, we simulated a predatory threat to determine if skinks assess risk differently if a weaver nest is present.We found a significant positive association between the presence of weaver nests and skink abundance. 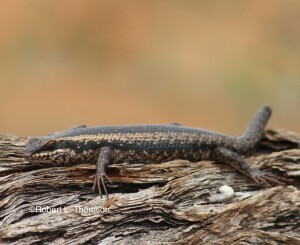 In the absence of nests, the type of tree did not influence skink abundance. Skinks used weaver nests and were more likely to perch on the nest than the tree. When threatened with predation, skinks preferred to take refuge in nests. 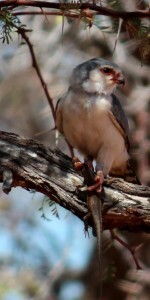 Surprisingly, the presence of nesting pygmy falcons in nests did not influence skink abundance, perhaps because of the abundance of nearby refuges within nests, tree crevices, or in debris at the tree base. We suggest that sociable weaver nests provide multiple benefits to skinks including lowered predation risk, thermal refuges and greater prey availability, although this requires experimental testing. In the current era of global climate change, sociable weaver nests may become a crucial resource for skinks seeking refuge as the Kalahari climate warms. A pygmy falcon about to have a tree skink for breakfast. Photo ©Robert L. Thomson. Kalahari tree skink. Photo ©Robert L. Thomson.